The Hotel Barcelo Playa Tambor Resort and Casino is an all-inclusive resort with 428 deluxe rooms that is situated on Bahia Ballena on the Nicoya Peninsula. It is one of the best all-inclusive resorts in the country, located in a natural and incredibly beautiful setting. 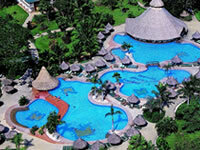 The Hotel Barcelo Playa Tambor is perfect for nature lovers who will also enjoy its 6 kilometer-long beach. Golfers will love it too, as there is a 9-hole, Par 35 golf course at the adjacent Barcelo Los Delfines Golf & Country Club. The food is delicious and includes one of the largest selections in Costa Rica. At the Hotel Barcelo Playa Tambor you will find elegantly appointed deluxe rooms close to the beach. They feature a terrace or balcony; air conditioning, full bathroom with hair dryer, mini bar, satellite TV, telephone, safe and room service. Other facilities include a swimming pool, Jacuzzi, 3 tennis courts, children's playground, zoo, theater offering nighttime shows, gym, souvenir shop, jeweler's, a discotheque and the Casino. An all-inclusive stay at this hotel includes accommodations and taxes, all meals, drinks and gratuities in your nightly rate. At the Hotel Barcelo Playa Tambor you will find elegantly appointed deluxe rooms close to the beach.